Our CSS code is simple and basically does two things — it absolutely positions all of our rotating items on top of each other in the wrapper DIV and hides the items using CSS display=none. That’s it! I hope you found this example useful. Brian’s career path zigzagged from pre-med at Purdue University to bike racing and a career in sales and marketing for Schwinn and other bicycle companies. That was until the inception of the World Wide Web, when he took his science and marketing background full force into web design. He was a founding member of Montclare Technologies—one of the first and hottest interactive agencies in the U.S. In 2000, he founded TrendMedia, a San Francisco-based web design and interactive agency. Brian is now one of the leading experts in web technology and social media, and is a recognized authority in web accessibility, WordPress and SEO. Not working in my browser yo. Just wanted to say thank you for posting this. This is a very elegant solution, and it’s very flexible to adapt to a wide range of applications. I digg this script, thanks! Still looking for a way to pause the loop on mouseover (for rotating DIVs that contain text). …And manually showing DIVs by clicking or hovering over a link. Rens, did you ever find a way to pause the loop on mouseover? I’m looking to do just that. Well done, Bryan! Thank you for sharing that. Thank you for this! This is perfectly fantastic! Why did the script stop working all of a sudden? Is it possible to add one more thing to the loop. So when an image is shown to animate it, so it slowly zooms into the image and then after the interval ends it moves to the next picture? There are a lot of scripts out there, but this was by far the easiest to follow and install. I have bookmarked for future reference. Thanks! Just tested the script in IE9. It works fine for me. Just tested in IE Tester. It works for me. 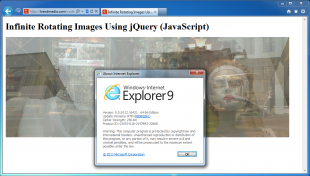 Wondering if you have IE9 installed on your virtual machine? 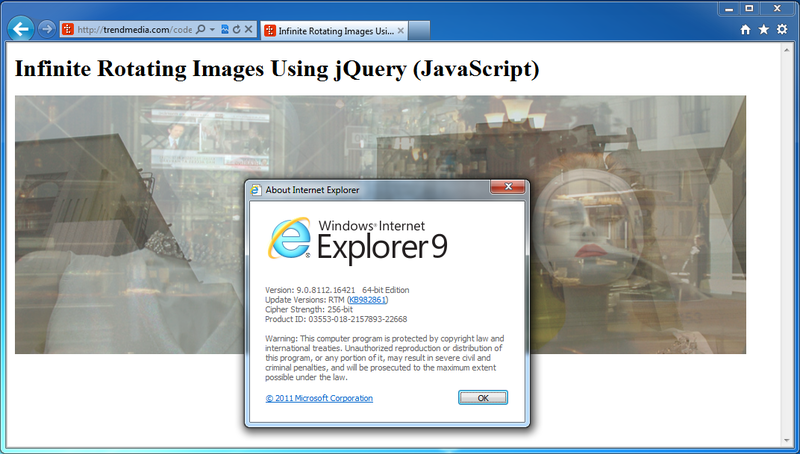 I believe IE Tester uses it to display content. Without IE9 installed, the IE9 view will not work. Same for IE10, etc. thank you very much – nice and simple! Very useful script! Thanks for posting, this saved me some time! Eric: If you haven’t sorted the FB page already, facebook allows your to embed an iframe into your company page – therefor you can have whatever you want on it! Except auto playing video’s I think, and maybe some other bits in their guidelines.. I love this code. Simple and clean. I’m trying to deploy it in a “trio” of images. I have a couple issues I’d like input on. The first is the images loop through once, per div. I’d like each div to loop independently, and infinitely. Seccond: this page doesn’t show in IE. Only FireFox. Any clues? hey man, i got this weird problem. everything is working fine n all, but if you leave the site open and ignore it while doing something else, when you go back to the site, the rotation will speed up ridiculously ‘to make up’ for the times it didn’t rotate while you’re looking at other things. any workaround? is this a common bug? windows 7 and mozilla firefox. i guess something was wrong with my jquery js file, it was a different version downloaded from another website. i used a different version and its working nicely now. One of my users reported this issue but I’m having trouble reproducing it. Does this script reliably work with later versions of JQuery also? Brian, could this be used to loop through two divs that just contain html text? (My case: French and English book titles, for a web page promoting the English translation). I am assuming anything could be in the looping divs, so long as each one had the class rotating-item? Chris, that’s exactly right. I’m using the script to rotate images, but it should work on any HTML element with class of .rotating-item — divs, headers, paragraphs, tables, etc. Please give it a shot and report back! Brian, this script is lovely and working perfectly for me, but(and I feel a bit dumb asking this, since the title of the post is Infinite Loop, but anyway) is there something I can replace infiniteLoop with in order for it to stop on the last image in the folder? Or to stay on the last image for longer than the rest? your script is very nice.but i have an issue. when i added the script in first page that is index page its working but when the same sript is added in second page images are not displaying..is it a bug. I’ve been playing for a couple of hours now but can’t seem to figure out how to get the loop to end on the final image and hold it – freeze so to speak. I’ve contemplated setting the final image as the background in the HTML doc and just ending the loop which would reveal the background, but there must be a more acceptable way – anyone? Not sure what you’re seeing. Just tested in Chrome. Works fine here. Thanks. 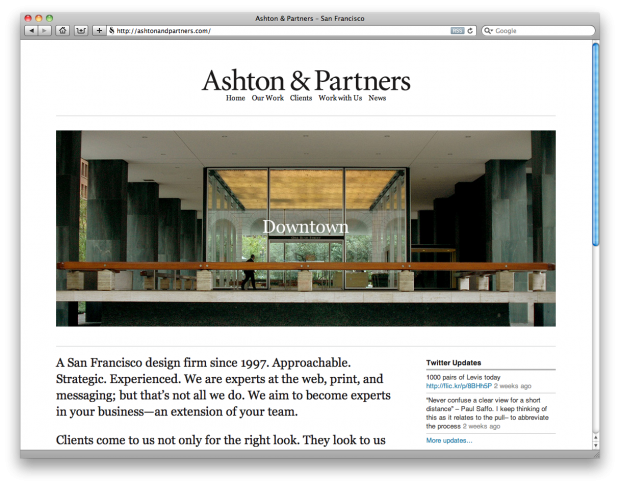 Your website for Ashton and Partners is a perfection. Sharing the code for the rotating images is a very generous service.. Thanks! Thank you for sharing this useful script. I’ve already implemented it. Thanks for the really great code. I’ve been trying to pause/restart the infinite loop with mouse-over/out. Pausing works with no problem, when restarting, however, the images timing and sequence is all out of wack. Any suggestions on pausing/restarting? Have you managed to solve this? Can you help me with pausing on mouseover? I’ve modified the script to produce a random result. Still needs a bit of tweaking to eliminate a blank space, but seems pretty good so far. I had to change the double-quotes to single-quotes to get functional syntax but other than that it works perfectly now. Thanks again. Thanks so much Matt and Aaron, this helped me SO MUCH! The only issue I’m having now is that although the code is working perfectly in FF and Chrome, In IE the first image (or comment, since I have this script running in 2 places on my page) loads and then just endlessly reloads. Is anyone else having issues in IE? This script is awesome and is exactly what I needed to fulfill a request for a rotating header image. 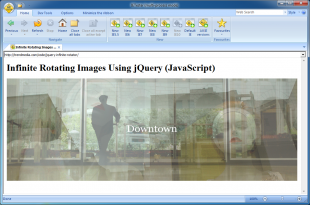 Unfortunately, the site also uses Lightbox for image viewing. These two scripts do not seem to jive with each other – in that only one will work at a time. Does anyone have any suggestions how I can have these two scripts work together? Great code, really helped me a lot and learned something a little bit! Thanks! It’s really a greaaaat script, and I can say, because i’m still a noob in this stuff and it worked immediately. But I would really love it to pauze on mouse over, and that the slide will continue when mouse is off the image. Can anybody help? It works like this: when you go to another tab for a while, then come back, there is basically a huge time delay. This time delay is given by elapsedTime. The code always checks to see whether elaspedTime is greater than the time it takes for the image to fade in and be displayed. If it is, then what happens is the sort of “queue-line” that is created with all these backed-up images is erased, and the code essentially starts with a clean slate. Whoops! Sorry, I think I posted on the wrong person’s comment. This code is supposed to fix the “rushing” that occurs when you leave the tab and come back. This is awesome! WOrks great on a mac in Firefox, and Chrome, but it’s not working for me in Safari. Any work arounds? How can i change the fade out color from white to black? Thanks for the great code. I am placing the images in a space 300 pixels high X 570 pixels wide. Some images are not 570 pixels wide. Is there a way to center? Guessing you could adjust the CSS top and left positing of .rotating-item to achieve this. See: http://css-tricks.com/snippets/css/absolute-center-vertical-horizontal-an-image/ Good luck! change image canvas size not image size to match the others will fix your problem. First of all, this thing is awesome! But I do have a question: For some reason when it loads a new image my browser automaticly scrolls up, is this supposed to happen? or did i maybe do something wrong? Great code, Brian. Works so smoothly–thanks so much! thank you very much, i’ve been struggling with this kind of concept and this works great! stupid question but how do I modify this code so that it doesn’t loop? I have used this code perfectly to work as instructed but I want to use it on another page where it stops on the last image. please someone reply to this, i am so stuck! 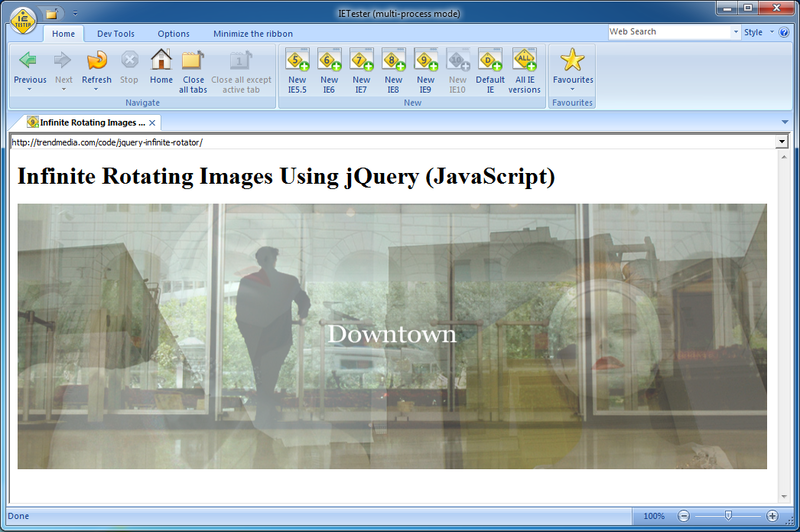 A link to the JS file goes in the HTML doc. Download the working demo files and you will see it. Just make sure your paths are correct and it will work. Good luck! Thanks for the reply Brian. Thanks so much, this was a great tutorial. You are the best … this rocks! Great script! I dispensed with the images (just used a background image) and used a mix of heading and paragraph tags. I also varied the positions of the headings so it gave a nicer effect to the presentation. “$ is not defined” (first line of infinite-rotator.js). I googled the issue and tried some suggested workarounds but haven’t figured it out yet. any suggestions? Thank you so much for this post. I’ve been googling for days on how to do this, and your post is the only one that simplifies it enough for me to understand. You rock! Script is working fine. but only two images are being shown.. remaining are not shown.. why is it so? I was trying to create a jQuery script to rotate elements when I found this page. Your script works great – thank you! For my purposes, I needed the rotator script to be reusable in multiple pages where the fade-effect would vary. In a nutshell, the modified script uses the data attribute (specified in the rotator wrapper markup) to pass a variable to the jQuery script. Hope someone elese can make use of this idea. Thanks again for posting the script! Hey Brian! As many have said, thanks for the post! I was searching around the site and noticed on the page http://ashtonandpartners.com/our-work/aaa/ there is the same header, but the arrows on the left and right side. This is what I’m really looking to do. Can you help me understand how to do this? Thanks! It’s a good question but is far more than I could easily explain. This said, power through the two SitePoint books listed at the end of the post and you’ll be able to create the same. It’s really the only way. You can do it! Thanks for this tutorial! I have one issue here: the fadeOut() is not executed. Instead the image is removed and the next image is faded in. Would you know what causes this? Thanks for the great work. Is there any way to get random image when refreshing the page. I tried many ways but didn’t get the result. Thank you for such an easy to understand tutorial. For the first time I actually have rotating images working! Great script! Has anyone tried adding “slide numbers” for lack of a better term, so that users can switch to an image if they want to go back to a previous image? Hey, works really well however I have a long lag on the initial rotate. I have swapped the initial fade transition to 0 & 1000 but it still takes an age about 10 seconds) before it starts to rotate through. This happens locally and on the server so I don’t think its to do with load time. Possible to add something like watermark above pictures and when user rightclicks at the “slideshow” to get that as saved? Thanks a tonn!!! worked perfectly well in my website. This is amazing. thanks for sharing. I had to reduce the fade in time because the display was off on Firefox (19.0.2), but now it works perfect. Hi, i’m still learning script and for some reason when i try to link it within dreamweaver, it goes missing and the pictures aren’t showing up in live view, can someone help? I have this running on my allisoniowa.com website and I have one question: upon opening the site, the first image takes about 15 seconds to load. Then cycles through the remaining images as expected. I’m trying to learn this stuff as I work and experiment, but it takes so much time. We’re all lucky to have sites like this where the code is already written for us, but there is still lots to learn. This script is wonderful. Thanks. The Elvis Egg is amazing. Any chance I could use that too. If not, I understand. You have been more than generous already. Thanks so much. May I use the Elvis egg too? It is just so cool but beyond my talent. You’re free to use the Elvis egg too if you can figure it out, which I bet you can. 😉 Spend some time looking at the code and playing with it. I bet you get it working. Good luck! Thanks so much for this great script. 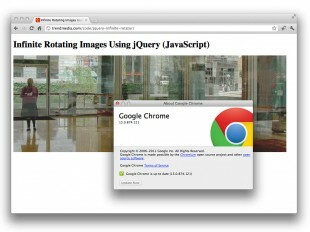 It works great on Chrome and on Firefox. On IE it aligns to the left side. On mobile, in the default Android browser, as in IE, it aligns left of the page, as if it were outside of the div in which it is place. In Chrome and Dolphin on Android, the block is centered. fixed the problem in IE and in the default mobile browser. However it threw the images in Chrome, Firefox, etc. over to the right. If you had any thought on how to fix this, I would very much appreciate it. Hi this has been a massive help. I was wondering if you can attach text to the jqueries, so each time the image changes a caption will change also? This is great! Thanks! How do I modify it so I can use it on three sections of my page at the same time? I would like to have three sets of rotating images. Thanks again! I dont know if this will help but I had a similar issue. Not being very jquery talented, I created two separate “rotating-item-wrapper” ID’s and “rotating-item” classes I then copied and modified the script by adding a “B” to the rotating item class. Works great. Works beautifully! Thank you very much for the quick code. Hi there! I just came across this. Thank you for the code. My website keeps displaying all the images like they are not styled and then applies the fade out to the topmost picture and cycles through for some reason. Can you please help – Thank you. Hi Dan. That means the CSS is not being applied to the code. You are seeing the unstyled elements. Either the CSS is missing (check your path) or is being overridden by more specific CSS rules (check your rules). Hope this helps! Thanks for the js code. This is ideal for my scenario. One challenge I’m having though…I would like the images to be full width and height of screen (i.e. background-position=’cover’). When I do that however, the display of images breaks. Can you possibly enlighten me? Thx. an image map having area and coords. please suggest me a code if any one aware of it. How do i change the last slide “itemInterval” value? I want last slide item interval is more than remaining item interval. This is a dream on my http pages but does not function on my https pages .. how can this be corrected?